I got inspired for this risotto recipe, one of my favourites, by a restaurant in Vercelli. In Italy I would use a toma cheese from Piedmont to prepare this recipe, but this kind of cheese is difficult to find here. After a few experiments I found out that Ossau-Iraty is quite similar to toma cheeses, but I also add some creamy Gorgonzola to add a bit more flavour and creaminess. 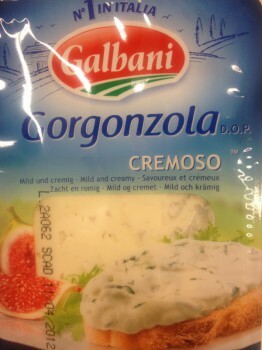 It’s important that you get the creamy version of Gorgonzola (like the one in the picture below) because the stronger version would cover the flavour of the Ossau-Iraty. Alternatively, you can replace the gorgonzola with Galbani Dolcelatte (it’s similar in flavour, very easy to find and cheaper too). First of all, read the recipe for basic risotto for hints about making risotto. If you are using non-toasted hazelnuts, preheat your oven to 180 °C. Place the hazelnuts in a baking pan and put in the oven for about 10 minutes. Let the hazelnuts cool down enough to be handled easily. Get a few hazelnuts in your hands and rub them to remove the skins (don’t worry if some skins don’t come off). Chop the hazelnuts into small pieces. Heat up the broth in a pan, or prepare one if you are using fresh ingredients. Finely chop the onion or shallots and fry on low heat in a pan with a knob of butter or with the olive oil. When the onion starts getting slightly translucent, but it’s not browned, add the rice. Turn up the heat to medium-low and fry the rice for 2 minutes stirring often. Add the wine and stir. It should evaporate quickly. When the wine is evaporated, add a ladle of broth. Add some salt and ground black pepper. Whenever the liquid in the pan is absorbed, add another ladle of broth. If you run out of broth before the rice is ready, you should start adding boiling water. While the rice is cooking dice the Ossau-Iraty in small pieces and the Gorgonzola in big chunks. Prepare the port reduction by putting the port in a small pan with the cinnamon. Bring to a boil and let simmer until reduced to about half. The rice needs to be cooked al dente; it’s ready when it’s not hard any more but it is still firm inside. It will take about 15 minutes, but it depends on the rice you are using. Check for seasoning and add more salt and black pepper if needed. Turn off the heat. Add the butter and the three cheeses, and stir well. Cover the pan and allow to sit for 2 or 3 minutes. Stir again and transfer to serving plates. 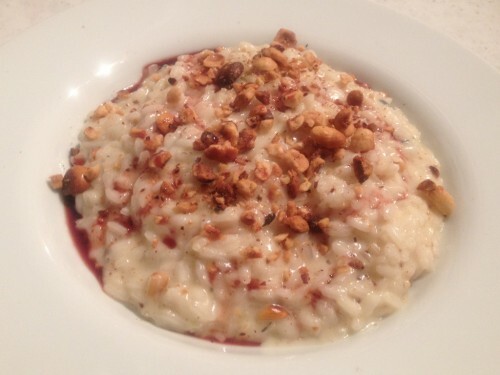 Pour the port reduction on the risotto and sprinkle it with the chopped hazelnuts. This entry was posted in first courses, main courses and tagged cinnamon, gorgonzola, hazelnuts, ossau-iraty, parmigiano, piedmont, piemonte, port, rice, risotto, toma by Marco Barisione. Bookmark the permalink. Have you considered implementing a blacklist?